Get to know the best restaurants in Vicksburg, MS and what makes them so special. From classic Southern cuisine to international surprises like hot tamales! We were looking forward to some good Southern cuisine during our visit to Vicksburg, Mississippi and we were pleasantly surprised at the different takes on it. We visited restaurants that stayed true to original recipes that went back decades, but also enjoyed modern interpretations of southern dishes. 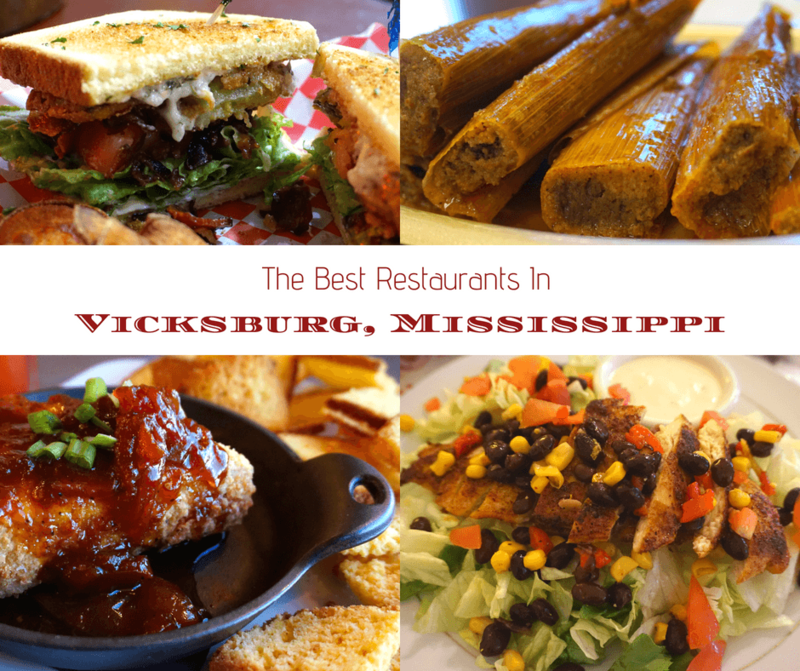 Below, we highlight what we believe to be the best restaurants in Vicksburg. You can find a little bit of everything in this city, so we know you’ll be drooling after you read this article! Our introduction to Vicksburg restaurants was Main Street Market. This charming cafe is all about southern comfort and hospitality! They make everything from scratch, and their menu changes weekly based on seasonal ingredients. We tried a few dishes during our visit. The first thing we had was their famous Chicken and Andouille Gumbo. We also tried their Blackened Chicken Salad and Crispy Chicken with Black Bean and Corn Pico. The freshness of the ingredients was apparent and the richness of the flavor was incredible. Another restaurant we visited that specializes in Southern cuisine was Walnut Hills. This restaurant has won a ton of awards, including “One of Mississippi’s 10 Best Restaurants” by CultureTrip.com and “Top 10 Places to Eat in Mississippi” by DeepSouthUSA.com. It’s also located in a historic home, which gives it it’s own uniqueness as well. To start, we had the house made Pimento Cheese and Cajun Sausage and for our entree we had their world famous award-winning Southern Plantation Fried Chicken. The chicken was seasoned wonderfully and had a nice crunch to it. Walnut Hills is also known for its desserts so we had to try their peanut butter chocolate cake! It was truly delicious; all we were missing was a glass of milk! If you’re looking for a great view of the mighty Mississippi River while you eat, head to 10 South Rooftop Bar & Grill. This place is so fun! The atmosphere, food, and cocktails are all great, but definitely one of the best things about 10 South is the view. We highly recommend going right before sunset. One of the newest restaurants in Vicksburg is Cottonwood Public House. This fun restaurant and pub is all about craft beer, craft pizza, and craft cocktails. It’s the first brewery in Vicksburg, and the space is casual and perfect for hanging out with family and friends. We’re not really into beer, so during our visit we stuck with rum and cokes. We also tried two of their pizzas: the Veggie Guy and Blackened Chicken. The Veggie Guy came with carrot-chile sauce, pickled mushrooms, smothered shallots, fried shallots, and chermoula. The Blackened Chicken came with bacon, buttermilk dressed romaine, and parmigiano-reggiano. Both were really good! Another downtown Vicksburg restaurant that we really liked was Roca Restaurant & Bar. This award winning restaurant creates richly flavored, contemporary Southern cuisine and they are known for their seafood and steaks. It’s an intimate setting; a place that we think would be perfect for a date night in Vicksburg. During our visit we had Fritters for an appetizer, their 80/20 Burger, and for dessert we had the Chocolate Marble Cheesecake. The Fritters were delicious and were made up of bacon and smoked Gouda and came with a rosemary honey mustard on the side. The burger came with American cheese and thick cut bacon on a brioche bun. That bacon was on point! And the cheesecake… well, it’s cheesecake! If you’re looking for a cool and quirky place to eat in Vicksburg, head over to The Tomato Place. They are located just south of Vicksburg along US 61. It looks like a produce stand, just sitting along the side of the highway, which is what makes it so charmingly weird. You can sit outside or inside, but either way you’re going to feel right at home. Their real fruit smoothies were cool and refreshing, and their dishes all had that home-cooked-meal feel. It seemed like there were a million smoothie flavors, but we picked one with a mix of berries that tasted heavenly. We also ordered their Fried Pork Rinds and Fried Green Tomato BLT. The BLT was one of the best things we ate in Vicksburg! If you’re looking for coffee shops in Vicksburg, we recommend Highway 61 Coffeehouse. It’s really cute and cozy; the perfect place to sip on some coffee or tea while reading a good book. They often times host artists and musicians too, which we thought was really cool. And their coffee isn’t too bad either lol! Did you know you could get hot tamales in Vicksburg? You sure can! And we suggest stopping at Solly’s Hot Tamales, established in 1939. It’s a tiny little place, but they serve tamales with big flavor! The Mississippi Delta is known for having great tamales, thanks to the migrant workers that arrived in the area over a hundred years ago. They brought with them a lot of things, including their favorite recipes. Tamales are so big in the area that there is even a Mississippi Tamale Trail, which Solly’s is listed on! Although Duff Green Mansion isn’t a restaurant, we still wanted to mention it here because if you stay at this charming and historic bed and breakfast, you get a delicious made from scratch breakfast every morning! We also recommend reading our Fun Things To Do In Vicksburg, Mississippi post! We hope that after reading this post you are no longer wondering where to eat in Vicksburg! The only issue you may have now is figuring out where to go first. But trust us, wherever you go, you won’t be disappointed! Buddy that featured image alone pulled me in bro. You know how to pick some fab eats. Must be that simian nose of yours. Mississippi does down home food proper. Delicious. What a delicious post this is! This looks really incredible post. Mouth watering food you shared with us. Really want to taste it all. Thank you so much for sharing it. Goldie’s Trail BBQ . Toney’s are a couple of good places too. But how you managed to miss Rusty’s is unthinkable. It IS the best restaurant in Vicksburg bar none. When you go back you must go to Rusty’s riverfront grille. Never had a bad experience there, always great. That Tomato Place looks divine! I’ve never seen a resto serve up fried pork rinds before. Totally fun and the smoothy evens it out, right? Okay, I’m drooling! I haven’t visited Mississippi but now I’d like to go eat my way through that area. The food looks amazing! We are total foodies and I always research the best restaurants before visiting a new city. So thanks for sharing these lovely ideas! We’ll have to try Cottonwood public house because we do love craft beer and pizza. And the Tomato place sounds and looks freaking awesome! What fun places! Wow – love the idea of the fried green tomato BLT. Actually the food is really fab – I’ll just have to get myself to Vicksburg. I love southern food! This post is making me really want some right now. So many of these are meals I grew up with, but some are new to me and sound delicious! Why are fried pork rinds not available all over the country?! Those look delicious! Love the quirky atmosphere at the Tomato place. Looks like a real gem!! The Fried Green Tomato BLT looks divine!! Did you have a favorite place or meal? Great showcase of Southern food! OMG too many too good food! Drooling right now. Those hot tamales look so tempting. Awesome reviews! Food looks great! I really love reading about Southern Food! It really shows a lot of dishes that I love! And as expected, the fried chicken is mouthwatering! good to know you can get a veggie pizza somewhere in town! classic southern food is like torture for vegetarians — so delicious, but almost nothing you can eat without breaking your diet. I’ve eaten at almost all of these places and they are all great, but I strongly agree Rusty’s belongs on the list.